This week a ton of mental energy was spent on researching vehicles. I figured that since this data is now in my head I would share in case anyone is interested. Plus, it is a window into how I think… so here goes. After making the decision to buy, I set out to find the right mid-size sedan that would serve as my daily driver for my 70 commuting miles each day as well as travel to clients, vendors, etc. I had a few non-negotiables. Estimate mileage must be over 30mpg highway. Since I make so many phone calls from the road, I counted interfaced Bluetooth as an essential. I wanted to find the absolute best value. I also knew that I cannot make a car buying decision until I have done my due diligence on the leaders of the class. In this case, there are 7 leaders. The cars I test drove were ( in order of test drive) the Toyota Camry, Honda Accord, Ford Fusion, Mazda 6, Hyundai Sonata, Chevy Malibu, and the Nissan Altima. Here are my brief overviews of each vehicle, and then a outline of how I made my decision. (Note, while I did a lot of reading and researching, Edmunds.com's reviews were absolutely essential in helping me through the process. My humble thanks is to backlink to them for each vehicle. 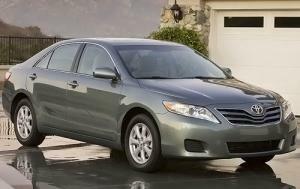 Toyota Camry: This was the first car I drove, and was immediately impressed with the car’s quiet and smooth ride. I sort of wondered if the Camry’s plushness was enhanced by the stark contrast to driving my ‘91 Corolla, but though I drove 6 other vehicles, none even came close to the Camry for the smoothness of the ride. From the beginning I was biased toward the Toyota. 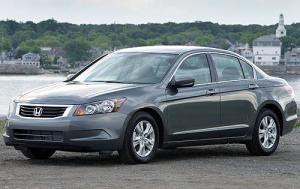 Honda Accord: The Honda was a clear runner-up for me. We loved our Civic, and its larger sibling does not disappoint inside or out. It has a sportier and more modern feel, and has the spotless Honda reliability record. Driving the Accord was nice, but the road noise was noticeably loader than in the Camry. All the rest of the vehicles were somewhere in the middle. The Accord was the loudest. 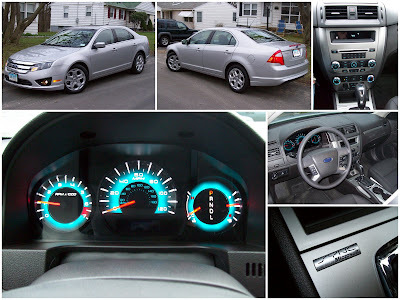 Ford Fusion: Ford was next. All the reviewers say this is a great vehicle, but I was concerned knowing Ford’s track record. The dealer* only had a Mercury Milan, which I was impressed with. The smooth quiet cabin has all the modern bells and whistles, was fun to drive, and interfaces through the Sync system which is really cool. We went to the second lot and drove a Fusion back. 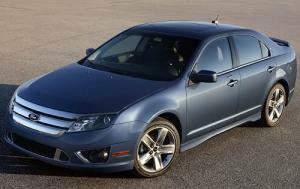 There was no noticeable difference between the Milan and the Fusion. Both were a pleasant surprise. Mazda 6: The Mazda folks were nice. The car has nice handling, and a modern feel all around. Its priced similar to the rest of the pack, but there is nothing that stands out. I left there unimpressed. 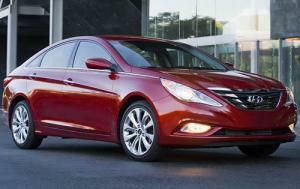 Hyundai Sonata: I almost skipped the Hyundai. In the late ‘90s and early ‘00s, Hyundai had a reputation. Unfortunately the “Hyundai like Sunday” Superbowl commercial kept running through my head. I ended up driving both the 2010 and 2011 model (the only 2011 model tested). The 2010 model is summed up in one word, ‘blah.’ The 2011 however floored me. It is a beautiful car, technologically advanced with a fun fast drive. It also comes in below the cost, even without the end of year incentives offered by the other players on their 2010s. 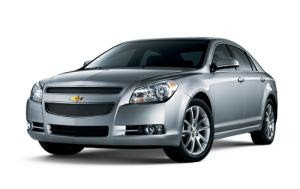 Chevy Malibu: Malibu has been advertised as a larger vehicle with higher mpg. It did not disappoint. It feels larger and more mature then the others. It drives very well and very quiet. All together, a bit more sophisticated. 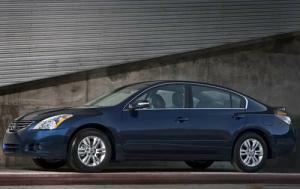 Nissan Sentra: I left the Sentra for last, because I knew it might be the ultimate winner. It is the class leader in driving experience, and the one I drove was just that. The overall experience was outstanding. It did not drive like a 4 cyl. It feels like a sports car in a sedan body. I sat with Avril feeding her a bean burrito at Taco Bell and considered my options. To my own surprise, my first two picks were the first two to be rejected. The Accord was simply too loud to be comfortable. Honda needs to put a lot more effort into sound deadening. The Camry, while peaceful to drive, practically put me to sleep. The inside of the Camry is still living in the ‘90s. It’s time to move into the modern era (right after resolving unintended acceleration). 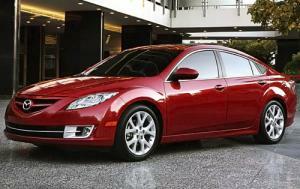 My next to go was the Mazda 6. It is simply a little too “me too.” It was nice enough, but there are better options. That left the Ford, Hyundai, Chevy, and Nissan. I could not in good conscience leave the Nissan on the list. It is priced significantly higher than the rest of the pack. If you had all the money in the world, the Nissan is a great choice. I do not. So that left two American cars and a low budget import. Who would have thought? At this point we were down to preference. The Hyundai had some risk factors. First, it is the first year after a significant remodel (never safe), and more then that it is still a Hyundai. Give them a few more years of good clean record, and they may end up a leader. That day is not here yet. Lastly, the Chevy vs. Ford dilemma had to be hashed out. Honestly, I have not been a traditional fan of either of these (though I loved my Thunderbird). The Malibu has a more sophisticated feel. The Ford has cooler features. Chevy took government money to bail themselves out. Ford proved that an American manufacturer can succeed in tough times with a smart business model. The Fusion won Motor Trend’s car of the year, as well as the Edmond’s Pick. It got my pick as well. I am very pleased with the car. It is a sporty enough drive to make me feel like I am not an old man yet. It is also quiet, and peaceful during post-work commutes. Sync is outstanding in what it promises. I have found the Sync system to be a little less intuitive then I expected, however, it is a huge step forward in voice recognition software driven systems. The tech in me is driven (no pun intended...) to use and tweak the Sync to perfection. Expect more Sync posts later. I visited two Ford dealerships. One in Danbury close to work, and one in Waterbury close to home. Knowing and respecting car salesmen, I knew I would disappoint one of them. Car salesmen get a bad rap, and I think it is our duty to take care of the people who serve us and make their living based on commission. I ultimately went with the one closer to home for a few reasons. The Danbury dealership felt typical. The Waterbury dealership shined. The maintenance package was better, and frankly, I wanted to support the local Waterbury economy (Fairfield County gets enough of my money as it is). This should not reflect poorly on the service I got at any of the dealerships. All the gents I spoke with were professional. Overall a very nice shopping experience. You drive an auto? I heard that in the US automatic gearboxes are the rule. I personally prefer a manual shift. Nice choice, I am surprised that none of the models of the cars except for the Camry are available in South Africa right now. We get them, with the possible exception of the Chevy, and the Fusion is not available here. I agree on your asessment of the Hyundai, but I am surprised you chose a Ford over a Japanese car... I do respect the way you came to your decision though. I am not a fan of the Camry. It is way to big for my taste, it looks and feels like an old man's car. I notice that there are no German cars on your list - No VW for one, and also no Beemer? And how about trying a Subaru? Again, I like your choice, the Ford really looks good. Nice family sedan and of course the tech-head features round of the package. Q, Interesting fact, the autos now get better mileage then the manuals. I very much prefer the manual, but my wife can't drive one, and that has been a problem with the car seats when I need to take the kids. SO I got the auto for her, and honestly I have driven a stick for 5 years, and I will enjoy the break. The VW and BMW are priced higher. I thought about the VW, but the specs for mileage just were not there. VW is a bit overpriced, and Audi is expensive, but the best of the German brands imo. The Jetta and Passat we get here suffers from reliability problems.